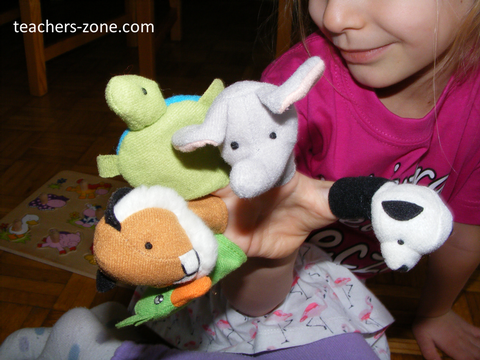 Your students will enjoy participating in this super simple and easy to remember rhyme if you use finger puppets to introduce a new set of vocabulary. 1. Put on one of the finger puppets and say "Hello, children. I'm (ex. a parrot)." and encourage children to say "Hello (ex. parrot)" . "Parrot finger, parrot finger, where are you? Here I am, here I am. How are you?" 3. Continue with other animals. 4. Then take out finger puppets one by one and say “Bye, bye children.” and students respond “Bye, bye, (ex. a parrot)." - You can introduce different types of greetings at the beginning (Hello, Hi, Good morning, Good afternoon) and at the end (Bye, Goodbye, See you) of the activity. Click here to download free zoo animals flash cards. Click here to download animals posters. Click here to download zoo animals worksheets. Please can you send me the prices for the sets. Can you post to colombia. Sorry, but we do not sell teaching resources. We just share teaching ideas and digital materials. Ask about finger puppets at the toy shop in your area. Good luck!